Many years ago when I was at college learning hospitality and catering, we used to learn cooking and cheffing skills. It was part and parcel of the course and I learnt many fantastic things in the kitchen that I carried through into jobs and still use to this day. Whilst training, we had to wear the full chefs uniform, chefs whites, aprons and about five tea towels hanging off of you. You had tea towels for rubbing plates down and tea towels to hold hot handles and taking dishes out of the oven. So when I'm at home, I have tea towels all over the place just so I can grab them quickly when I need them. 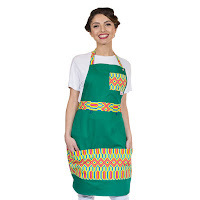 So when I saw a new style of apron I was very excited. It also brought back many fun memories from college and work. I have the pleasure in introducing Lobster Homeware to you. Lobster Homeware have only just launched, so they are a brand new company with a lot of potential. This company is going to go worldwide. 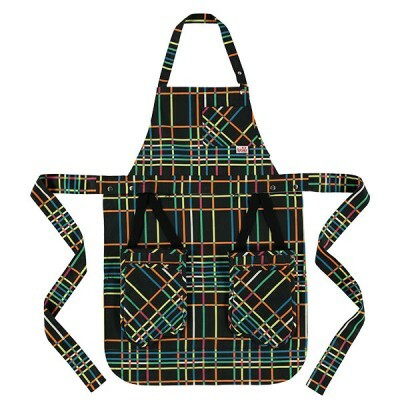 They have designed an apron which can also hold its own oven gloves, and there are even little loops where you place your tea towels !!!!!!! I thought this was a genius idea, and perfect for any kitchen, whether it be a professional kitchen or a home kitchen. You can read all about Nathalie's story on her website. She actually designed this years ago and has sewn many for her friends. Let me show you how it arrives first. It comes in its own cute bag, so this also makes for a great gift as well as for yourself. 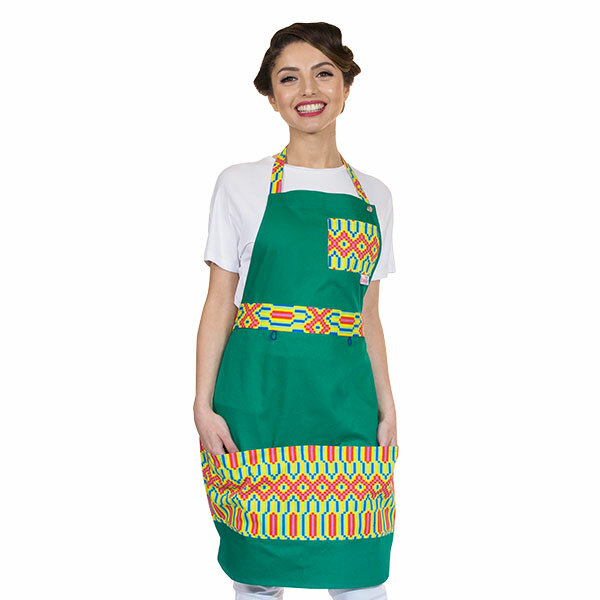 It is very neatly packaged and when you the touch the apron, you just know that it is really good quality material. I chose the blue and grey stripped print, so myself and my husband could wear it. However they do in other prints which I will show you at the end. This design is called Theo, named after the designers father. So this is just the bottom half of the apron as I wanted to show you in detail how it works. So you can see how the two oven gloves are attached by the waist band. They are actually attached to elasticated strips. Yes, these babies will stretch far enough to get right into an oven. Can you see the little loops near the middle, well these are for your tea towels so you can literally just push and pull them through. I haven't made it clear with this photo, but there is actually a pocket for each of the gloves if you want to put them away, or you can use the pocket for anything else....more towels, ingredients, recipe papers, notes, utensils...whatever you fancy. The waist band can unpop too. So if you wish to put the oven gloves underneath the apron, or the elasticated straps, then you have the option to take that away. The oven gloves have their own pockets too. You can see by the shape of the oven gloves that they do actually look like lobster claws. Quite cute really. Or, it could be to to hide the straps when you remove the gloves to wash them. The gloves are attached via a velcro strip. This was a great idea as it makes it nice and versatile. You can use the gloves on their own, and you can use the apron on its own or together, the choice is yours. I like this as you can use the apron exactly how you like it, but you have many options too. So, here's the top part of the apron. You can see it has an adjustable neck tie that can be popped off. There is also a small pocket for whatever you fancy. For any professional kitchen you have to be able to get your apron off quickly, so it literally needs to be able to be pulled off. So these little poppers as useful as they are especially for us little people, but they can also save someone from serious damage in an kitchen accident. They happen, which is why aprons are suggested. I asked my friend Miss M to model the apron for me, so here she is looking gorgeous as ever...straight after work !!! 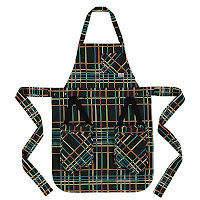 It is an apron to fit all builds. Miss M is a slim build, but I did manage to get my husband in it too and he's a big man! You can see how stylish it is. This is a very smart design, which is why I think it will suit all kinds of kitchens. Look at that stretch - good hey !!! 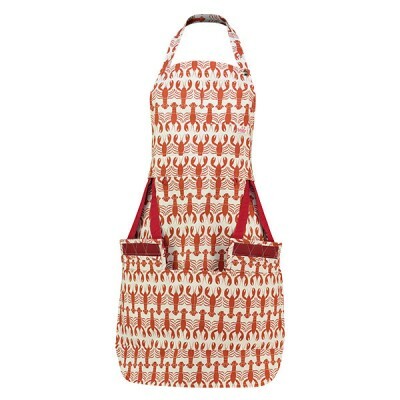 If you work in the kitchen a lot, you must try a Lobster Homeware Apron. They retail at £45.00 each and they can purchased direct from the website. They are All handmade and made in Britain. I believe they are worth every penny due to the design, and the quality. This apron will last for years and years. Here are a couple are their current designs. They also have a few designs that are in the pipeline and can be pre-ordered now. As you can see, these are not boring prints, they are funky prints, and there really is something for everyone. What do you think? The website Lobster Homewares also has videos to show you how it works too. So I suggest you have a quick look before placing your orders. 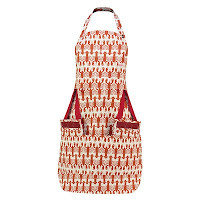 To get a huge 20% discount on your own Lobster Homeware Apron, please use the code LOB100 online at checkout.